The anterior hypothalamic “thermostat” adjusts heat balance to maintain body core temperature. Heat exchange is determined by convection, conduction, evaporation, and radiation. Radiation, conduction, and convection are determined by the difference between the skin temperature and the environmental temperature. Behavioral mechanisms can assist thermoregulation. The rate of heat loss depends primarily on the surface temperature of the skin, which is in turn a function of the skin’s blood flow. The blood flow of the skin varies in response to changes in the body’s core temperature and to changes in temperature of the external environment. There are two different physiologic responses to a change in body temperature. A forced change in body temperature results when an environmental stress is sufficient to overcome the body thermoregulatory systems. Prolonged immersion in cool water would result in forced hypothermia, a drop in body core temperature. Prolonged confinement in a hot room could result in forced hyperthermia, an elevation in body core temperature. A regulated change in body temperature occurs when the hypothalamic set point is shifted. A regulated hyperthermia accompanies the release of pyrogens during an influenza infection. A regulated hypothermia follows exposure to organophosphate poisons. A forced drop in body core temperature initiates adrenergic heat conservation. Piloerection of cutaneous hair decreases conductive heat loss. Sweating is decreased to reduce evaporative heat loss. Cutaneous adrenergic vasoconstriction decreases blood flow and therefore diminishes radiant loss of heat (common theme 7). These physiologic responses are augmented by behavioral responses that diminish exposure to cold, such as moving to a warmer environment or putting on additional clothes. A drop in body core temperature also stimulates heat production. Shivering and movement increase metabolic heat production. In neonates, adrenergic activity increases metabolism of neonatal brown fat. Long-term cold exposure increases thyroid hormone release and increases basal metabolic rate (common theme 4). A forced increase in body core temperature initiates heat loss. A decrease in vascular sympathetic nerve activity causes an increase in cutaneous blood flow, which augments the radiant loss of heat. Sympathetic cholinergic activity increases sweating. Excessive sweating can deplete body Na+. Aldosterone release decreases Na+ lost in sweat in long-term heat adaptation. Increases in body core temperature also result in decreased heat production. There can be a behavioral decrease in activity, movement to a cooler environment, or removal of clothes. In the long term, basal metabolic rate can be diminished by lower thyroid hormone release. During the early stages of the flu, pyrogens are produced that elevate the hypothalamic thermoregulatory set point, usually to around 39°C. 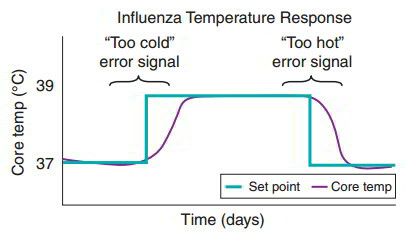 The body core temperature is 37°C, below the set point, generating a “too cold” error signal. The thermoregulatory balance is altered to favor heat gain mechanisms, such as shivering and reduced cutaneous blood flow, complemented by behavioral changes such as curling up in a fetal position and getting under blankets. 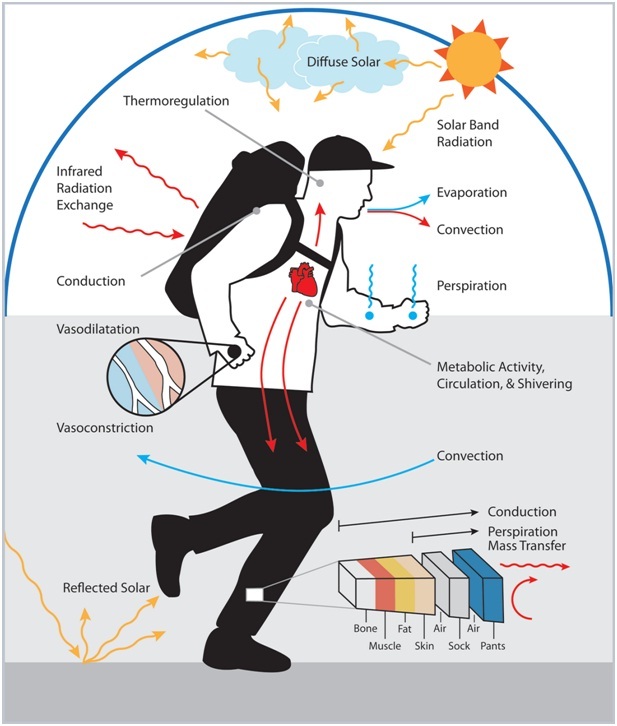 These mechanisms persist even though body core temperature is higher than “normal.” As body core temperature and set point come into balance at 39°C, there is some reduction in the heat gain mechanisms. The febrile response to influenza can be blocked by aspirin, ibuprofen, and acetaminophen, all of which block prostaglandin production. The febrile response to influenza, however, is a protective physiologic response and assists the immune system in combating the infection. Individuals allowed to exhibit a febrile response have a shorter duration of infection and faster recover. Current research is examining the protective role of regulated hypothermia in enhancing survival following hemorrhage. Thermoregulation entails both a normal negative feedback control and a hypothalamic set point.